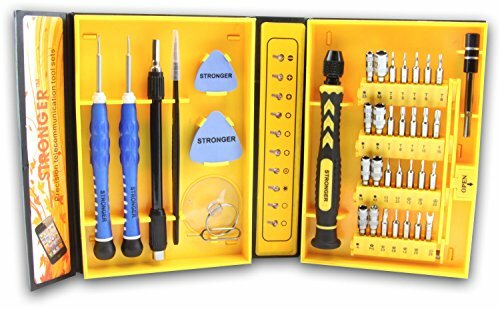 This Precision Tool Kit includes virtually everything required to repair various electronic devices: mobile cell phones (iPhone, iPad, Samsung, tablets, smartphones), laptops, computers, video game consoles (PSP, Playstation, Xbox, Nintendo, NDS). Manufactured with top quality materials, this kit has what it takes to perform precise and reliable repairs. Use the 2 spudgers and suction cup to safely disassemble housings without damaging it. Use the flexible extension bar to easily reach screws in hard to reach places, while applying constant pressure utilizing the screwdriver's free spinning end cap. All this packed in a 6 x 4 x 2 inches neatly organized and durable case. Keep it in the car, a drawer at home, or even throw it in your luggage when traveling so you are always ready for any electronic malfunction. - 2pc. Large Spudger, Small Spudger (pry pricks). Specially designed for repairing electronics, mobile cell phones, laptops, tablets, and gaming systems. Includes specialty tools for Apple products such as the pentalobe "star" .8mm and 1.2 mm, tri-wing and triangle tip. Ergonomically designed handle for great comfort and precision, with a free spinning endcap allowing constant pressure to be applied while turning. 2 spudgers (pry pricks) included to easily pry open housings without damaging it. 100% Customer Satisfaction. Fast Same-Day Shipping by 12:00 PM PDT. 30-Day Money Back Guarantee. 12 Months Warranty. Exclusive $100000 Product Protection Plan! If you have any questions about this product by LB1 High Performance, contact us by completing and submitting the form below. If you are looking for a specif part number, please include it with your message.